Discussion in 'Sport Cruisers' started by jamesgang, Aug 9, 2010. Okay folks! This is the Official 1998 SR290DA thread. All SR290DA owners (and non-owners) are welcome to join in. The 290 is a great boat so chime in with questions, answers, advice, information, heads ups, how-tos, pictures, or anything else related to the '98 290 Sundancer. Nice to have the thread, always good to hear thoughts from all those who write on CSR, and more specifically those that might share the same problems with the same boat. Can we make it the 1998 to 2001 SR290DA thread? Woo-HOO! I can finally stop searching for this thread! Sure, you qualify as a 1998 Sea Ray Sundancer 290 "non-owner" so you are welcome. Any '98 owners have any idea where the blower/exhaust fan for the galley exhaust is located? I think mine is deceased. Great to see the new thread . It is actually my dad who bought the 1998 290. But since i have a bit more experience than him, i really wanted to get setup on here to find out as much as we can. I believe it is behind the refrigerator. The blower is accessable if you pull out the microwave, I believe there's enough room to get to what you need to in order to get it out. Be careful pulling out the microwave you might accidently chip the laminant -don't ask me how I know that please. Oh crap! :wow: I was afraid of that. I'd much rather try the microwave first. Thanks for the advice on the laminate, jcoll, I'll be careful. UPDATE, FINALLY . . . Finally got to work on the exhaust vent and I think I may feel stupid. You gotta turn on the "Power Vents" switch in the power panel first, then press the switch with the little fan on it. Then it will work. Anyhow, I'm pretty sure I did all that before, but - oh well - after I dragged the microwave out of the wall, wiggled some wires and/or tapped the blower fan, and tried the switches again, the darn thing started working. It just wanted me to do all that work first. So folks, in the 98' 290 the exhaust blower is located to the right up behind the microwave. The Glomax thingy is back there too as well as an outlet and about a thousand wires. Go here to read an interesting article on the '98 290. Took the boat out yesterday, only to notice that the vent cover on the port side that exhausts the galley area is gone. Not sure what happened. Looked at parts manual today and can't find a part number for it. Can't even find a picture of it. Its white, and is mounted on the port side below the rub rail below the forward porthole. 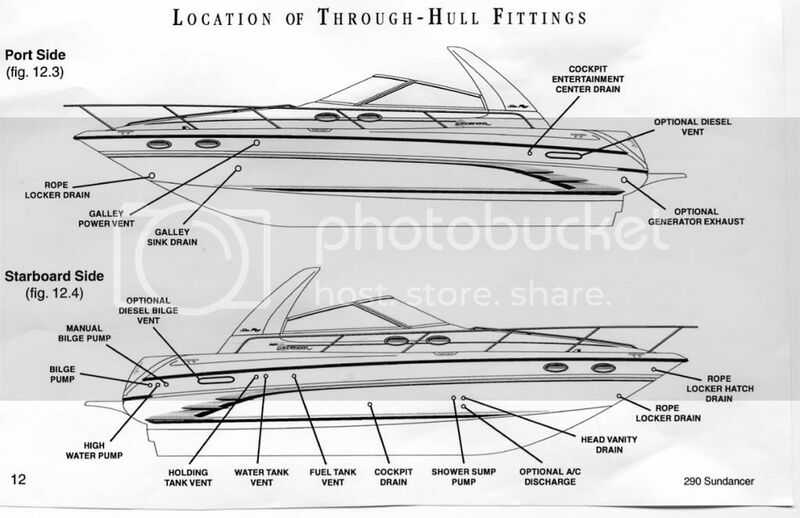 Hey Goodgrief, I found a diagram of the Location of Thru Hull Fittings on page 12 of the 290 Supplemental Manual that tells me the part name but does not give a part number. It's called a "galley power vent cover". I'll post that diagram tonite. You should be able to order directly from Sea Ray or your local Sea Ray dealer. Thanks! e-mailed flounder pounder and the new cover and other goodies are on the way. The boat you are looking at has TWIN 4.3 engines. The general consensus is that the 98-01 290 with twin 4.3s performs just OK. With a light to moderate load, most find the planing/cruising performance good. Some report a lack of power and slow planing when the boat is fully loaded down. If a 98-01 290 with 4.3s has all options AND is in great shape AND is offered at a good price, I would not turn it down due to the 4.3s. Twin 5.0s or 5.7s is a better choice, though. Stay away from the 98 290 with the single 7.4. Underpowered without a doubt. The 98-01 290 needs twins, and Sea Ray stopped offering the single 7.4 in 2000. A/C is another story. Adding A/C is expensive, and generally not worth it since most 290s have factory A/C. I would definitely look for another one. The other major option to consider is a generator. You need to decide if having AC power and running A/C when anchored is important to you. I installed a subwoofer under the helm, now I'm looking for a place to put the amp. Already ran the power and speaker wires to the cabin where the existing stereo is. What say you? After some thought, I think perhaps Jersey Mike might be on to something. There are a lot of these boats out there and limiting the thread title to 1998 I think hinders knowledge sharing as it implies it is for that year only.